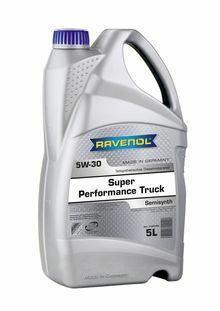 RAVENOL Super Performance Truck SAE 5W-30 is a high alloyed USHPD low friction engine oil for commercial vehicles. Because of the use of synthetic basic oils the viscosity area 5W-30 could be realised. Because of the cold viscosity SAE 5W a definite cold start (low cold start corrosion) and a supply of all lubrication areas is guaranteed as quickly as possible at very low outside temperatures. Extreme stress applications are controlled by the high temperature viscosity SAE 30. Minimized friction loss and wear.